When I first read the headline of this NPR blog post ("For Love Or Insurance? Rabbi Seeks Young Wife To Lower Health Costs") I couldn't even imagine what this was all about. It turns out there's a rabbi in Florida who needs better health insurance coverage and is looking for a young wife to make it happen. Turns out that Rabbi Craig Ezring, a nursing home chaplain, was able to get decent insurance before his wife died. He and his wife established a small corporation to procure health insurance, but when his wife died four years ago his rates soared 38 percent to over $18,000 just to cover him. The 56-year-old rabbi comes from a very rabbinic family. His father Abraham Ezring is an Orthodox rabbi in Florida and all of his brothers are rabbis as well, including Rabbi Murray Ezring, a Conservative rabbi in Charlotte, North Carolina. The NPR blog post isn't the first time Rabbi Craig Ezring has made news. In 2005, his funny yet insightful "Dear Abby" letter was published. Ezring letter titled "Oy Vey! 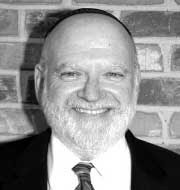 Rabbi Is Exposed to Patient's Discomfort," told the story of how Ezring, as a chaplain, would visit hospital patients wearing a three-piece suit. One patient, he explained, felt terribly uncomfortable lying there "in a hospital gown with her tuchas sticking out" while the rabbi sat there in a three-piece suit. So, Ezring went to the nurse's station and changed into a hospital gown. The patient was then relaxed enough to share her concerns with the rabbi/chaplain. He concludes, "The visit took a little longer than usual, and when I finished our session with a prayer for healing, I rose from the chair. As I did, the sound as my thighs ripped themselves from the Naugahyde brought a huge smile to both our faces. I was laughing so hard I forgot to hold the back of the gown as I headed back down the hall -- so I was exposed... Fortunately, the nurses had a sense of humor. One said, 'Not a bad tush for a rabbi!'" Rabbi Ezring explains in his "Dear Abby" letter that he learned an important lesson that day. Abby commends him for his sensitivity and creativity. She writes, "Your suit may have been off for her, but my hat is off to you for going the extra mile to make a difference in a sick woman's life. Your method may have been unorthodox, but your message of healing far surpassed any fashion statement." When Rabbi Craig Ezring's annual health insurance costs soared 38 percent this year to a whopping $18,636, he did more than just complain. For several years, the Boca Raton, Fla., rabbi had been getting coverage through a small corporation he formed with his wife. When she died four years ago, he thought the cost of his insurance coverage would drop. Instead it rose. That's partly because Ezring, 56, had a heart bypass surgery a couple of years ago. Nonetheless, he said he's still quite healthy, and does ballroom and Latin dancing twice a week. An insurance broker told him his small business insurance rate is based on the age of the owner of the company. So, Ezring posted on his blog that he was looking for a younger woman who wouldn't mind marrying him to help him get cheaper coverage. "Give some thought to the possibility of marrying me ... a good insurance plan is all I ask," he wrote. "Okay there maybe one or two other things I ask for, but sadly, right now insurance has become a top priority." Ezring, a rabbi at several nursing homes and assisted living facilities in South Florida, said he's had a few "comical offers" of marriage in response to his plea, including one asking if he wanted to move to South Carolina. Ezring said his insurer, UnitedHealthcare, has been good to him: The company makes sure he gets services he needs and can see the doctors he wants. But with the latest rate hike, he feels like he's working mostly just to afford his health coverage. He's shopped for other policies, but other companies won't offer him coverage. When told that Florida Gov. Rick Scott, who vehemently opposes the federal health overhaul, is only paying about $400 a year for his state-subsidized health insurance, Ezring chuckled. "It would be lovely if everyone could pay that amount for really good insurance," he said. Rabbi Ezring seems like a pretty funny (and creative) guy. I wish him well in his quest to get less expensive health insurance, but even if he isn't successful in that endeavor at least he was able to spread the word about how expensive medical coverage is in our country. I'm sure that the only reason why this man wants a younger women is for cheap health care. It makes total sense to me.